This study explores what can be learned from teachers engaged with secondary students in an outside-learning context. Seven teachers share their lived experiences of teaching that extend beyond the classroom. The focus is not on the subject material outdoors, but on the teachers' pedagogical experiences with children. A phenomenological methodology is used to reveal the lived experiences of the teachers engaged outside their school. The educators in this study conduct outdoor lessons that cover a range of academic disciplines and school-based programs. 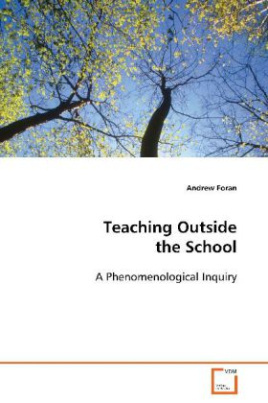 Central to this thesis is the conscious exploration of outside teaching by asking the question: What is the pedagogical experience of teaching outside the school? Each lived experience aims to discover the essence of the experience by presenting how these teachers were connected to the pedagogical moment when they left the inside-classroom to go outdoors. The intention is to bring experience vividly into presence and thereby make it immediately and unreflectively recognizable to other teachers. I aim to show the reader by means of evoking the wonder of teaching outside.